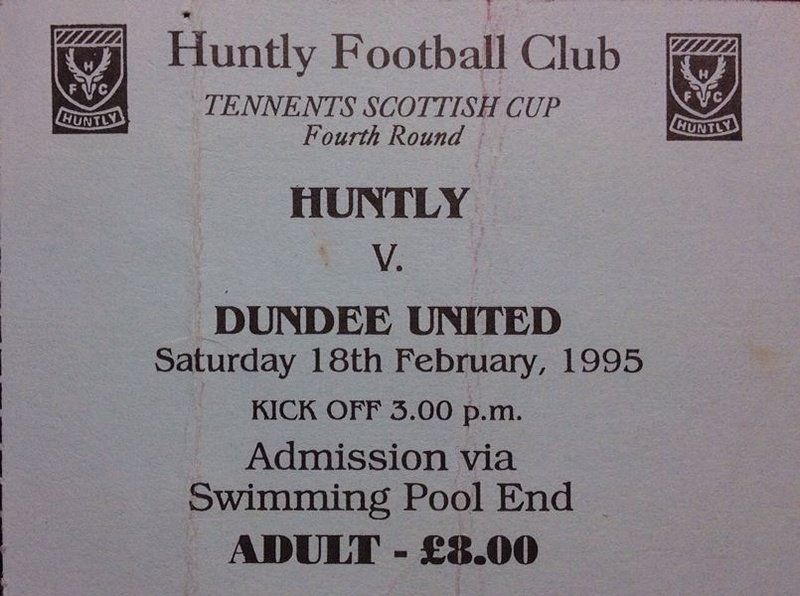 United's first meeting with nonleague opposition in the Scottish Cup for 43 years saw progress being made to the quarter finals, but not before the Highland League champions gave the tangerines an uncomfortable last quarter of an hour. It all seemed over bar the shouting when David Hannah notched a third for United. 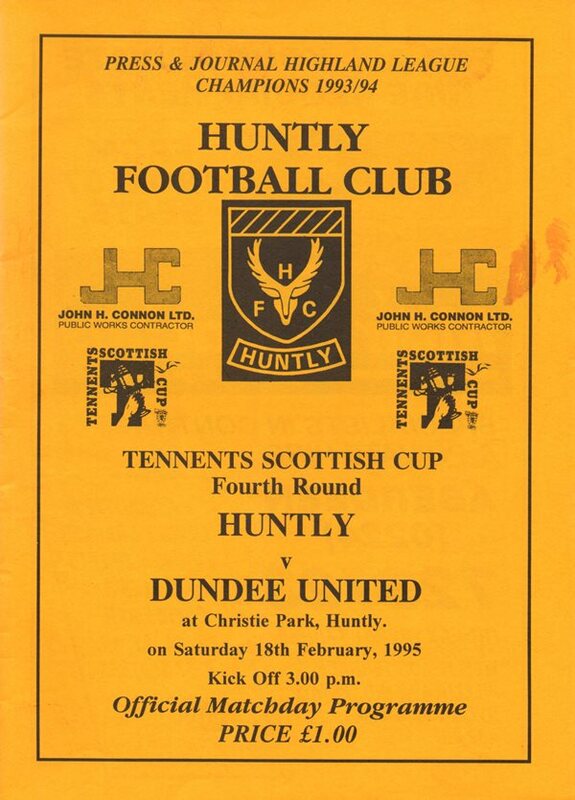 But Huntly who had played well against the wind in the second half, were tenacious and pegged one back and with luck might have had another right at the death. Yet the tie could have been over in the very first minute as Sergio created an opening for Jim Mclnally, but John Gardiner blocked his shot and a Maurice Malpas effort from the rebound was blocked. Whyte headed a De Barros cross narrowly past as the Highland league side threatened for the first time, but two minutes later Maurice Malpas did likewise at the other end. United went ahead and took control of the game in the thirteenth minute when Billy McKinlay spread the play out to Dave Bowman on the wing and Craig Brewster's looping header from 12 yards evaded the efforts of Gardiner to keep it out. If the former United keeper was at fault for the goal then he redeemed himself with a brilliant save from Sergio's first timer from 20 yards five minutes later. David Hannah blasted a first time shot against the face of the bar in the 27th minute, but a second error by John Gardiner eventually saw us increase our lead. Gordan Petric hammered a free-kick into the area. Gardiner missed the ball which fell to Maurice Malpas who headed home from ten yards despite Mone's attempt to clear on the line. The start of the second half was delayed for ten minutes after a barrier collapsed during the interval and when play got under way again, Craig Brewster conjured up the miss of the season, sweeping a Billy McKinlay cross over the bar from six yards with the goal at his mercy. However, fifteen minutes from I time, the Tangerines got a third when David Hannah took a Nixon cross in his stride before tucking the ball past the keeper from just outside the six yard box. But the Highland League side went down in a blaze of glory, pulling a goal back when Lennox played the ball into the Stewart's path and he drove it past Kelham O'Hanlon form 15 yards. They pressurised us to the end, but were unable to inflict any further damage and United booked their passage to the next on the back of a very professional first half performance. Golac commented, "This was their cup final and they worked very hard and did very well, but we thought we were on our holidays in the second half."